Electrical: Exposed wiring is a fire hazard. Have an electrician inspect your barn and fix any issues. Metal conduit is one of the best ways to protect the barn’s wiring from rodents, curious horses, and dust. Plumbing: Are water lines deep and freeze proof? Add insulation to exposed lines, and invest in bucket warmers. For outside areas, consider trough warmers. Ventilation: Even though it’s cold – keep the air flowing. Use products to absorb ammonia, and keep windows open. Most horses LOVE the cold weather, so resist the urge to lock up everything to make it warmer. Hay: Is your storage area waterproof? Can your winter hay supply be lifted on pallets or tires so the damp ground doesn’t mold the hay? Do you have enough, and then some, for the winter? Blankets: Time for a deep clean and re-waterproofing. Most horse blanket repair pros can do this for you to save some time. Also, double check buckles and straps. Your horse’s feet: Fall is the time to talk to your Farrier about winter weather changes. Are snow pads in order? What about leather pads to protect from the hard and frozen ground? Your horse’s health: Fall is also the time that rising ACTH levels in your horse’s blood can lead to laminitis. Work with your Vet and perhaps run some simple blood tests to make sure your horse’s metabolism is within normal ranges. And last but not least, enjoy the chill in the air! 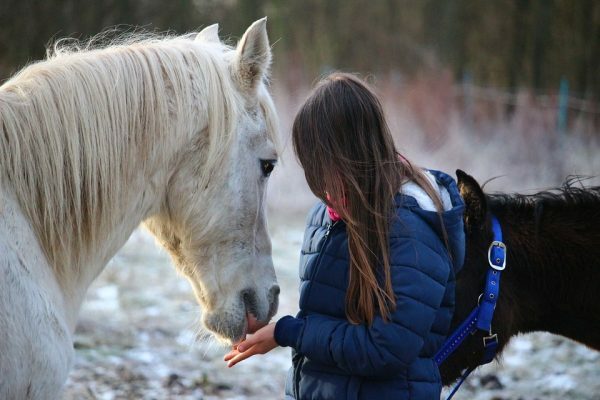 Spend lots of time currying that winter coat, ride in the crisp air that gives your horse some pep to his step, and enjoy the changing seasons with your horse!